According to a latest market report titled “Ring Laser Gyroscope Market - Global Industry Analysis, Size, Share, Growth, Trends, and Forecast, 2018 – 2026,” published by Transparency Market Research, the global ring laser gyroscope market is expected to reach market value of US$ 948.3 Mn by 2026, expanding at a CAGR of 3.5% from 2018 to 2026. According to the research study, the Asia Pacific market is expected to register prominent CAGR of 4.9% during the forecast period propelled by growing demand from the defense and commercial sector and increasing demand for advanced inertial navigation systems in aircraft, naval ships, and submarines. Some of the major factors driving the global ring laser gyroscope market includes increased demand for advanced navigation systems in aircraft applications and rapid growth of robotics and space vehicles.There is a growing trend of using laser gyroscopes for developing and upgrading inertial navigation systems to incorporate better accuracy as compared to FOG based navigation systems or other satellite based navigation systems. Additionally, ring laser gyroscopes have various advantages such as compact size and being lightweight (owing to extensive research and development during the last decade and ongoing R&D activities), which are suitable for aircraft application, thus finding increasing adoption in aerial applications. Defense organizations of major economies across the globe are investing to upgrade the existing defense vessels and in the development of new and advanced aircrafts, and unmanned vehicles. This is anticipated to passively drive the ring laser gyroscope market during the forecast period. The global ring laser gyroscope market has been segmented based on number of axis, application, and end-user. Based on number of axis, the market is segmented into single axis ring laser gyroscope, and multi axis ring laser gyroscope. According to TMR analysis, the single axis ring laser gyroscope segment is estimated to dominate the global market in terms of revenue, while multi axes ring laser gyroscope is anticipated to dominate the market in terms of growth rate during the forecast period. This is mainly due to increasing demand for multi axis ring laser gyroscopes in various commercial applications. Based on application, the global ring laser gyroscopemarket is categorized into platform stabilization, missile navigation, aeronautics navigation, submarine navigation, and satellite navigation. Among the application segments, the aeronautics navigation segment is anticipated to be dominant, expanding at a CAGR of 3.4% during the forecast period. On the basis of end-user, the global ring laser gyroscope market is segmented into commercial, defense, and spacecraft. According to TMR analysis, defense segment accounted for the largest market share in 2017, contributing 51.7% to the global market. Ring laser gyroscope is mostly employed in aircrafts, missiles, naval ships, and submarines, and in underwater and aerial unmanned vehicles in the defense arena. The geographical segmentation comprises North America, Europe, Asia Pacific, Middle East & Africa, and South America. 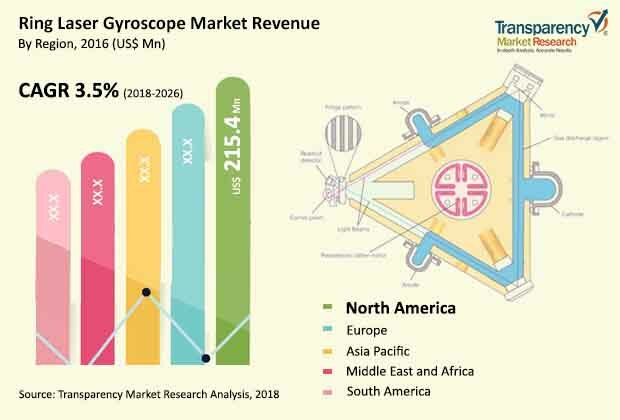 According to TMR analysis, currently the ring laser gyroscope market is dominated by North America, whereas Asia Pacific is anticipated to reflect highest CAGR of 4.9% during the forecast period, propelled due to growing demand from defense and commercial applications in this geography. The research study includes profiles of leading companies operating in the global ring laser gyroscopemarket. Market players have been profiled in terms of attributes such as company overview, financial overview, business strategies, recent developments, and SWOT analysis. Some of the key players in the ring laser gyroscope market are Ericco International Limited, Heppel Photonics GmbH, Honeywell International Inc., Kearfott Corporation, Mitsubishi Precision Co., Ltd, Northrop Grumman Corporation, Optics Blazer AG, Safran Electronics & Defense SAS, Sperry Marine B.V, Teledyne CDL, Inc., and Xsens Technologies B.V. Various business strategies are being adopted by market leaders, focusing on business expansion by developing strategic partnerships to offer innovative solutions in the end-use market.